The Chrysler Group was the first automaker to boast of their success at the Michigan State Police vehicle tests when they announced that their new all wheel drive Dodge Charger Pursuit had beaten the Ford Police Interceptor that is based on the Taurus SHO around the Grattan Raceway course. The Charger Pursuit in rear drive form had already beaten the Chevrolet Caprice to claim the title of the fastest RWD cop car on the MSP road course and with the debut of the AWD Charger Pursuit – the Hemi powered cop car was able to turn a faster lap than the all wheel drive, EcoBoost powered Taurus police car. Fortunately for Ford Motor Company, the Charger didn’t win every competition and the folks under the Blue Oval have announced that the Taurus SHO based Police Interceptor Sedan posted the quickest acceleration figures. The AWD Taurus cop car dashed from a stop to 60 miles per hour in just 5.66 seconds while the Chevrolet Caprice police car got there in 6.01 seconds and the AWD Charger Pursuit took 6.04 seconds to hit 60. When the cars ran from a stop up to 100 miles per hour, the Ford Police Interceptor Sedan spent just 13.5 seconds getting to the target speed while the Caprice took 14.35 seconds and the Charger took 14.70 seconds. "These tests conducted by the Michigan State Police are an important validation of best-in-class performance in outright acceleration – the most critical measure of police pursuit vehicles," said Bill Gubing, Ford chief engineer. "Agencies tell us if the bad guys see the police vehicle quickly close in pursuit, they're less likely to try to run. If this can help reduce the number of high-speed chases, then we could improve public safety on our nation's roads." So while the Dodge Charger Pursuit might be the quicker police car for an officer chasing a bad guy around a road course, the Ford Taurus Police Interceptor will catch up to the perp a bit quicker in a short dash down a straight line. The Michigan State Police vehicle tests also have sport utility vehicles included and this year’s trials brought about the introduction of the 3.5L twin turbo EcoBoost V6 paired with an advanced all wheel drive system. This Explorer Sport-based police SUV was able to hit 60 miles per hour in 6.28 seconds while 100mph took the Ford police SUV just 15.51 seconds. The only other SUV in the testing procedures was the Chevrolet Tahoe powered by a 5.3L V8 – a model which took a balmy 8.22 seconds to hit 60 and 21.95 second to get to 100mph. 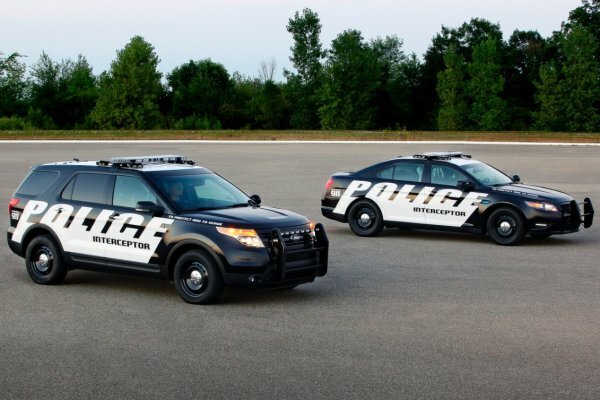 This is a clear display that when it comes to an SUV that will allow the police to catch up to a criminal, the Ford Police Interceptor Utility is the best choice in the market.